We are happy to announce the launch of CircuitLab, the first web-based circuit simulator with the power and accuracy needed for board-level design tasks. 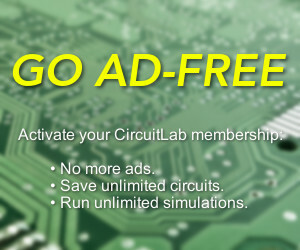 CircuitLab is now available free of charge to practicing electrical engineers, engineering students, and electronics hobbyists around the world. CircuitLab is completely web-based, which not only means it’s cross-platform (Windows/Mac/Linux) and requires no installation or plug-ins, but also means that all the circuits you choose to make public can be shared by just copy & pasting a URL! if I use my microcontroller’s digital PWM module for audio output, how will my low-pass filtering affect the signal before it goes into my speakers? is my 1N4148 diode good enough to clamp the inductive voltage spike from my solenoid? … and if not, how about the 1N5817? what’s the bandwidth for this TL082 op-amp as a gain-of-100 inverting amplifier? … and when I put a BJT push-pull output stage after it? can I build a simple LED current regulator using a LM317 adjustable voltage regulator? … and can I do it using just one transistor instead? Take a look through our example circuits to see more of what CircuitLab can do.